Merrit Lewis (Ertel) is an Art Director at Section 127 with a focus on Experiential Graphic Design. Heather McKendree is a Senior Graphic Designer at Section 127 and a native Hoosier with a passion for designing brand experiences for the built environment. She works with a talented team to design and implement brand experiences for the built environment. Heather McKendree earned her Bachelor of Arts in studio art at Indiana University, Bloomington, with a concentration in graphic design and minor in art history. During the past 10 years, she has designed work for a publishing company, outdoor history museum, and several architectural firms in Indianapolis. Angela Hill is the President of Section 127 in Indianapolis, Indiana. Kevin Gormal is a Senior Creative Director at Sector 127, a a full-service creative firm in the Indianapolis. Kevin Gormal holds a New Media in Informatics degree with a focus on visual communications from Indiana University-Indianapolis. SEGD Branded Environments—March 26-27 in Las Vegas—will focus on showing YOU how to leverage the latest tools, technologies and trends in experiential design for branded spaces. Last year, a record-breaking number of participants gathered in Las Vegas for the SEGD Branded Environments event at the Digital Signage Expo (DSE). If you were there, you know this event is awesome. If you weren't... well, you won't want to miss another year. The 2019 SEGD Branded Environments event is going to be bigger and better than ever! This year's Branded Environments program will feature a diverse line-up of speakers whose work spans the globe. Learn from bright, innovative leaders, who are challenging the traditional expectations of how brand impacts environment. Branding and Las Vegas: what more could you ask for? Register today and we'll see you in March! LAS VEGAS– The SEGD Branded Environments event returns to the Digital Signage Expo in Las Vegas for the third year in a row by popular demand with a diverse lineup of speakers, tour offerings and opportunities to connect with fellow participants as well as the local design community. 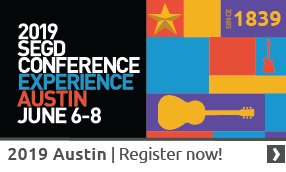 SEGD Branded Environments 2019—is the event for the design of brand-centric customer experiences.